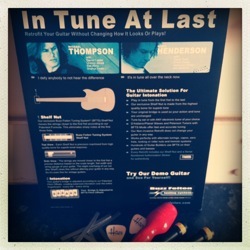 I'm really pleased that Haze Guitars can now offer the Buzz Feiten Tuning System. Odds are, unless you've been living in a small cave in the mountains, you'll have heard about the Buzz Feiten system and you'll probably know something of what it can do. Even a guitarist with the tinnest of tin-ears will know that his or her perfectly tuned guitar won't sound completely in-tune all over the fretboard. Different positions and different chord shapes can give that unpleasant out-of-tune wobble that's really irritating. And, if you're heading to the studio with this going on, it can get well beyond irritating. Intonation is the means by which we tweak the sounding length of each string to improve these tuning issues but, for some people, it doesn't get close enough. It wasn't close enough for Buzz Feiten. So he did something about it. Now you can too. The Buzz Feiten Tuning System can be retrofitted onto pretty much any electric guitar or bass. Most installations do not need to make any permanent modifications to the instrument. The existing nut is replaced with a BFTS 'shelf' nut which is custom cut to each particular guitar during installation and the intonation is modified based on the system's sweetened tunings. The result is an instrument that sounds much more in tune all over the neck and across all chord shapes. It'll work with capos, and altered tunings too. The only visual indication that your guitar has been modified is that the nut appears very slightly wider than normal (about 1mm or even less). That, and a tiny, serial-numbered, sticker indicating that the BFTS has been properly installed by an authorised fitter Note: you don't have to stick this to your guitar if you don't want but keep it in the case as confirmation in case you ever sell on the instrument. The BFTS system is tightly controlled and the sticker is sort of like your 'certificate of authentication'. As far as I know, Haze Guitars is the only place in Ireland that you can have the Buzz Feiten system retrofitted to your electric guitar or bass. If you've struggled to get your guitar sounding properly in tune, the BFTS might be just what the doctor ordered. The BFTS is something that—I think—many people know about without completely understanding so feel free to shout out in the comments if you've questions about the system. Of course, you can also drop me a line if you'd like to arrange an appointment to discuss.